The ESL Pro League Season 7 Finals will be divided into 2 parts: group stage and playoffs. In the group stage, the 16 teams will fight in a two double-elimination format. All teams will start in the upper bracket and, if a team loses, they will drop to the lower bracket and continue to play until they're eliminated from the tournament. The first round will be played at best of 1, all the other games are best of 3. The top three teams from each group advance to the playoffs: the first teams of each group will advance to the semifinals, the 2nd and 3rd teams will advance to the quarterfinals, as high seeds and lower seeds respectively. The playoffs will be a single elimination bracket, quarterfinals and semifinals are bo3 and the grand finals bo5. 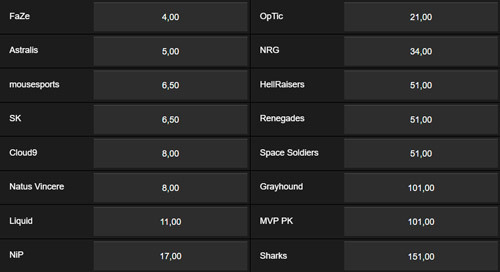 Most of the betting odds regarding this tournament (and other esports) will be relatively the same with all bookies. However, small differences can make or break your wallet, so it’s important you have all the info possible to help you make the correct choice. Due to the fact there's still so much time left before the official start of this tournament, it's understandable that there are no betting options and odds available at this time. We'll keep you updated, no worries! HellRaisers: ANGE1, bondik, DeadFox, woxic, ISSAA. NRG Esports: FugLy, Brehze, CeRq, daps, nahtE. OpTic Gaming: k0nfig, cajunb, gade, Snappi, JUGi. MVP PK: solo, glow, zeff, HSK, XigN. Greyhound Gaming: Gratisfaction, erkaSt, dexter, DickStacy, malta. Shark Esports: nak, exit, leo_drunky, jnt, RCF. The predictions will be available before the first match. Since even before this tournament started, we knew things would get rough and tough for some teams. That’s exactly what happened – there were a couple of surprises, and there were complete wipeouts. We’ve now reached the quarterfinals and some of the usual fan-favorites are there such as Astralis and Na Vi. The match we’ll be looking at today is between Team Liquid and Mousesports. Mousesports got off to a great start beating Sharks Esports but they were stopped in their tracks by FaZe, the winners of IEM Sydney 2018. Naturally, they had to go through the lower bracket rounds where they cleaned house and dealt with NRG Esports and Heroic with the same score (2:0). Team Liquid who got defeated by Astralis didn’t have to follow up with the lower bracket rounds as they were eliminated in round 3 of the upper bracket (thus giving them an automatic spot in the quarterfinals). So, what do we have in store for this quarterfinals match? Let’s take a closer look! Even though a defeat against FaZe wasn’t what Mousesports intended, the vigor with which they played in the lower brackets was that missing element to success. It seems that they’ve simply decided to sit down and have a serious talk about what happened and how to proceed. They passed the following tests with flying colors and they don’t look like a team that’s willing to give up. The match against Team Liquid is an important one and, if they overcome this hurdle, they’ll have to face off against NaVi. Mousesports is pretty strong on Cache and if that specific map gets picked up – we could be seeing an easy win. But, all is yet to be seen. Easy wins against Grayhound and Space Soldiers was enough to give Team Liquid the boost they needed, but ultimately, they couldn’t take down Astralis. ‘Twistzz’ had a great match against Astralis (albeit it might not seem that way due to stats) and if it wasn’t for him, the defeat would have been even greater. But, the past is the past and Team Liquid know this which is why they’ve started focusing on the match with Mousesports. Like every other team still in the tournament, they want to reach that grand finals spot and become the crowned masters of the ESL Pro League Season 7 – but they’ll have to go through Mousesports first. Who will claim their spot in the semifinals? This is a tough match to judge and predict since both teams garner quality talent and gameplay. It will all come down to how the team performs; we all know that communication is incredibly important and without it, you could have a team with 5 superstars and you could still end up losing. Mousesports had to go through one more team than Team Liquid, but this isn’t that big of an advantage. In all honesty, I think that Team Liquid wins because they faced Astralis and didn’t lose by a huge margin, whilst Mousesports lost to FaZe but with a devastating defeat on Mirage (4-16). Therefore, Team Liquid should be able to tackle Mousesports – but barely. FaZe is on a mission after winning IEM Sydney and they don’t seem to be slowing down. However, NaVi caused a small upset by defeating FaZe 2:0, an unexpected result of the 3rd round Upper Brackets. NaVi isn’t such a strong team; they lost to Astralis and Mousesports in 2018 and the tournament before that was in 2016. So how did NaVi defeat a powerhouse such as FaZe? No one knows for sure, FaZe didn’t show up completely whilst NaVi did and with ‘electronic’ being the MVP, it’s no wonder they won. But, we all know how FaZe get when they experience an unexpected defeat; they crank up the speakers and blast through their opposition like a knife through hot butter. ‘rain’ had a positive KDA ratio in their match against NaVi so he’ll be the player to follow in the match against SK Gaming. Can SK Gaming pull it off? According to their previous track record with FaZe, they can and they most likely will. Sure, they lost to Astralis in the Upper Bracket stages of this tournament, but they easily defeated everyone in the lower brackets (including Renegades which isn’t a bad team at all). SK plays well on Inferno and could upset the natural order of things by defeating a motivated FaZe Clan. SK doesn’t exactly have star players, but they work wonderfully as a team, something not a lot of others can say. Due to this, they can potentially outplay FaZe and take the win. Who will show off against NaVi in the Semifinals? This is another tough prediction to make. The part we all know is that we’re in for an amazing battle. FaZe Clan is looking strong, especially after their Sydney victory, but SK Gaming has won against FaZe in crucial moments during various tournaments. I have to go with SK Gaming here. FaZe hasn’t done a lot to influence their strategy so they can beat SK and it just seems like SK, at least against FaZe, have all the strings under their control. Quarterfinals of ESL Pro League Season 7 Finals are behind us and now we know the 2 remaining teams to go through to the semifinals. Most of you already know which ones we're talking about here – Team Liquid and FaZe Clan. Both quarterfinals matches went on with a 2-0 result, however, don't let that fool you – both matches were absolutely thrilling to watch. Well, first maps to be more precise – second ones on both matches were pretty much considered as blowouts. Enough with beating around the bushes though – let's jump straight to the ESL Pro League Season 7 Finals predictions for both semifinal matches! Natus Vincere did not think they will have a tough job until the third round of Upper Bracket group stage A where they faced off against FaZe Clan. However, the situation unveiled in a rather stressful manner for NaVi after a tough contest against Heroic. The matchup ended 2-1 in their favor but they started off with a loss on Cache. Luckily, they managed to pick themselves up and get back to 1-1 after a 16-13 win on Overpass. The last map was Mirage and NaVi squeezed the win after overtime with a marvelous performance by s1mple. After such a difficult matchup, there was a lot of skepticism surrounding their matchup against FaZe. Luckily, NaVi did the impossible and completely annihilated Niko's team in a 2-0 manner. This time around they'll be going up against Team Liquid which is bound to be a tough nut to crack. Who will get the chance to take the big W home? In all honesty here, both Team Liquid and NaVi have good chances of winning this. The matchup itself is tied on a dead end and will probably be decided on the smallest of margins. Every little mistake will count, that's for sure… and knowing the history of both of these teams, mistakes are bound to be scarce since there's a lot on the line here. In the end, I honestly wouldn't recommend betting on Team Liquid as NaVi looks much sharper after beating FaZe in such a fine manner. On the other hand, FaZe Clan managed to surprise us all yet again and cement their place into the semifinals with a brilliant display against SK Gaming. In all honesty, we didn't think they will go through simply becuase of their massively negative results in their last couple of matches against SK Gaming. However, Niko and Co managed to surprise us all once again, and I'm honestly happy they did! Why? Well, simply because we are going to have a match worthy of the finals right here in the semi's! Astralis is going to be a tough nut to crack, but after overcoming the odds against SK Gaming, I'm pretty confident in FaZe Clan's ability to close it off! So far in this tournament, Astralis definitely looks like the champion. They've humiliated OpTic Gaming (16-3) and strolled through SK Gamin and Team Liquid without losing a single map. Now they are facing the second best team out there… but a team which didn't play 100% to their standards so far. Let me remind you – FaZe Clan lost against NaVi earlier in the tournament but were able to cement their place in the semifinals after beating SK. Truth be told – Astralis, led by in-form device and dupreeh, are looking too strong for anyone at the moment… and they are probably going to be the deciding factor here. FaZe Clan or Astralis | Who will go through to the Grand Finals? Obviously, we are looking at 2 of the best CS: GO teams at the moment (at least in my honest opinion) which is exactly why I am referring to this match as the grand finals before the grand finals! If you are a huge fan of CS: GO eSports scene, then this matchup is a no-brainer! You can expect a lot of high-quality action in what will most certainly be a 3-map match. So, if you are already set to bet on this match, consider going with Total Maps Over bet. The odds are pretty good (around 2.00 on most eSports bookies) and it shouldn't really fail to deliver knowing the quality and determination of both teams. One of these grand finalists came as a complete surprise and it’s not Astralis. Team Liquid had some monster games and they’ve truly unlocked their full potential. The first match against Mousesports was an endurance one where they ultimately managed to win the first round 22:20. The second round was a piece of cake. They faced NaVi in the semifinals and came out on top here as well. Consolidating their players and using the correct tactics, coupled with great communication, is exactly what was needed for Team Liquid to wake up. Now, they’re facing Astralis yet again. Astralis have beaten them in the upper bracket rounds 2:0 and it wasn’t exactly a close match. As for Astralis, they got their revenge against FaZe in what was a complete demolition. FaZe couldn’t get 10 map wins as Astralis were in complete control. Does Team Liquid have what it takes to take the number 1 spot, or will Astralis repeat their previous encounter with them? Let’s take a look. After analyzing the quarterfinals and semifinals matches of Team Liquid, one could safely assume that they’re here to fight to the end. We already know what teams are capable of doing when they have a chance at revenge and, as with FaZe in Sydney, it’s Astralis. Astralis have already caused problems for Liquid which is why I think they’ll push as hard as they can. And it’s not like they don’t have what it takes – we saw what Team Liquid is capable of doing once they set their minds to it. ‘NAF’ was amazing in the game against Mousesports but that’s not what Team Liquid is all about. They play as a team and every one of them is crucial to the success of the team. You won’t see a CS: GO LeBron here. A team such as Astralis doesn’t seem shaky, but you could bet your money that they are. They’ve lost the IEM Sydney grand finals to FaZe; something that came as a surprise. Now, was that defeat because of pressure, lack of team communication, or just FaZe showing up – we can’t know. But, it’s not looking good. Of course, we aren’t saying that Astralis will lose catastrophically and that they’ll falter yet again, but there’s a certain pattern to their playstyle when it’s crucial they give 110%. Although, there certainly is a lot of motivation in the team right now due to the incredible win against FaZe. …known after the grand finals. In all honesty, I can’t pick a favorite here. Both teams have been known to choke in the finals, and they have never faced against each other in the finals either. Team Liquid has a bit more momentum, but Astralis have already beaten them once in the upper brackets. There are so many factors at play here that you can’t pick one side and say it’ll surely win. But, what I am sure of is that the finals will definitely have more than 3 maps in play. Since the teams are so close in almost every category, there shouldn’t be an easy 3:0 win. No CS:GO tournament would be complete without proper live coverage which you can easily watch by checking out the stream below!